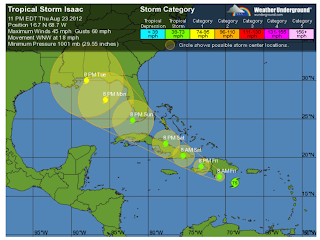 Love to Live in Pensacola, Florida: Gulf Coast prepares for possible Hurricane "Isaac"
Gulf Coast prepares for possible Hurricane "Isaac"
We are carefully watching tropical storm Isaac. 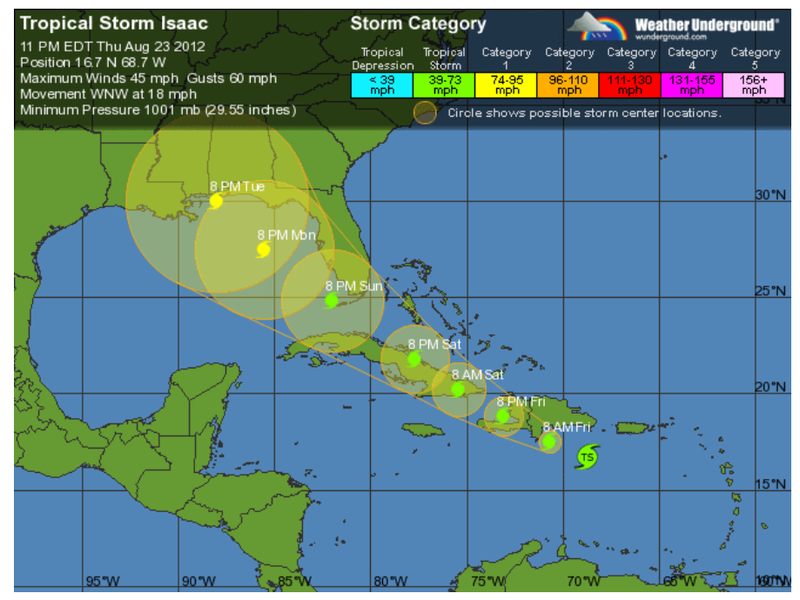 Currently, the Pensacola area is in the projected path for the storm with expected landfall of middle of next week. Luckily, the storm is only projected to be a category 1, however, we should take this storm seriously and plan accordingly for some type of tropical weather. The National Weather Service will issue a tropical storm or hurricane watch within 24-36 hours of hurricane conditions. Local emergency management advises residents to be self-sufficient for 3-14 days. You must make several preparations to prepare for this storm should it impact our area. Please review the following information in regards to hurricanes including your obligations in securing the home. Make sure to follow us on Facebook for emergency updates before, during, and after any storm. Plan ahead. If you don’t already have a plan, make one right now. It’s not too late! Listen to the news! Stay informed at all times. Have a battery operated radio and batteries. Know your evacuation routes. Determine where you would go and how you would get there. Make sure to include your pets in your evacuation plans as most shelters and many hotels do not allow for pets. 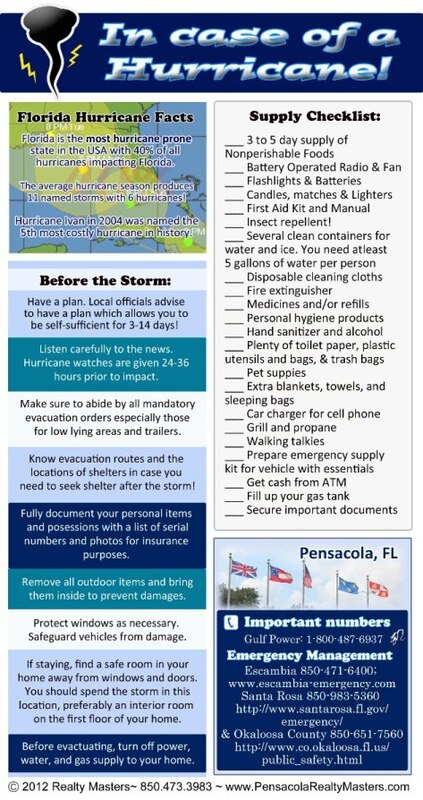 If you plan on staying in your home, make sure you are prepared with supplies to last 3-14 days. Learn the location of nearby shelters in case you need to leave your home after a storm. Be aware of and abide by all evacuation orders, especially in low lying areas and coastal areas prone to flooding. Locate and secure all important papers, including insurance policies, wills, license, etc. Talk to your children about how and when to call 911. Make sure you have an operable fire extinguisher and everyone knows how to use it. Establish emergency meeting place in case your family gets separated. 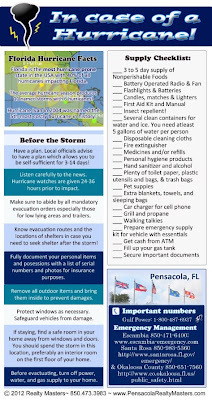 Local emergency management experts encourage you to have 3-14 days’ worth of supplies. ___ Several clean containers for water and ice. You need at least 5 gallons of water per person. Bring in all outdoor furniture, decorations, garbage cans, and anything else that is not tied down. These items, if not removed, can cause serious damage to your home or to a neighbor. DO NOT tape your windows. Taping your windows do not provide any sort of protection. Determine if window protection is necessary. If your windows have pre-existing holes and/or pegs on your windows, you should find hurricane shutters in storage in your home. Relatively easily, these panels fit over the windows and secure with bolts and wing nuts. If your property owner has invested in expensive hurricane shutters, please make sure to use them. You are not required to install plywood on your windows and doors. You must have written approval prior to installing plywood on your home so we can obtain authorization from the property owner. Please make sure to properly secure plywood over the windows with hurricane clips being very careful not to damage the siding. Make sure to park your vehicle away from trees or any low lying areas prone to flooding. Remove perishable items from fridge and throw out prior to evacuating. Before evacuating, you must turn off the power, water, and gas supply to the home. Please call your utility company or our office with questions. Do not go outside or try to travel during the storm. Stay indoors until the storm is declared over and be weary of the “eye of the storm” when it appears calm as conditions quickly worsen as the eye passes. Find a safe room in your home that can serve as protection during the worst parts of the storm. Seeking an interior room, with the fewest windows or doors, is the safest option. Many times this area is the bathroom, laundry room or hallway on the first floor of your home. If you lose power during a storm, you should unplug all appliances and turn off the air conditioner system. After receiving power back, wait at least 30 minutes before turning on air conditioner and major appliances to prevent power surges. Stay away from downed power lines. Do not attempt to walk or drive through flooded areas. Hidden debris can be very dangerous and depth levels deceiving. Do not use generators inside the home or in an enclosed room. Carbon monoxide poisoning is deadly. Do not wire generators to the breaker box. Do not attempt to climb on the roof or enter any other hazardous situation. Without power, you will find yourself more exposed to insects. Protect yourself and family from bugs by wearing insect repellent. With recent West Nile Virus outbreaks, this is very important! Report any damage to management immediately. We will dispatch contractors on a triage system as soon as conditions and roads allow. Make sure to list to officials for instructions. Typically, roads are not passable and curfews are imposed. For your safety, do not leave your home (unless necessary for your safety) until officials say it’s okay to do so. For questions, call Emergency Management. Gulf Power- 1-800-487-6937. Use this number to report downed power lines or dangerous conditions. If power is restored to your neighborhood and not your home, you can report it here as well. Before you call, check all circuit breakers and the line going to your meter to ensure it is not damaged. West Nile Virus found in Pensacola! What to do if you get bit by a shark! !